*Disclosure- I received the above mentioned product courtesy of the sponsor for the purpose of this review. All opinions are genuine, based on my experience with the product, and have not been influenced by promotional items. This post may contain affiliate links. Please see my Policy tab for more information. A few years back I was extremely sick. It seemed the more I went to the doctor for help, the worse I felt. For 2 years I tried medication after medication, and by the last one I truly felt like I was knocking on death's door. I knew if something didn't change, I probably wasn't going to make it much longer. I scrapped my prescriptions and started looking for alternative methods of healing myself naturally, which led me to the many benefits of using essential oils for natural healing. *I am NOT advising anyone to go against their doctor's wishes or give up their current medications. I am merely pointing out one of the ways on how I took control of my own health. Please do your own research and make decisions on what you feel is best for you* Since I have ulcerative colitis, I was intrigued by the use of peppermint essential oils because it sounded like it offered many benefits in helping to alleviate some of my symptoms. • Aids Digestion. Place a drop in your morning herbal tea. • Improves Concentration and Alertness. Use 2 drops on the tongue and 1 under the nose. • Helps Boost Energy Levels. Rub a few drops on the back of the neck and shoulders. • Curbs Appetites. Just inhale the scent to trigger a sense of fullness. • Clears Congestion. Add a few drops to a humidifier. • Relieve Bug Bite Itch. Use 1 drop peppermint oil and 1 drop lavender oil. Apply to bite. • Relieves stomach aches. Rub a drop into the belly. • Treats Dandruff. Add a few drops to shampoo. • Natural Insecticide. It repels ants, spiders, roaches, fleas and mice. 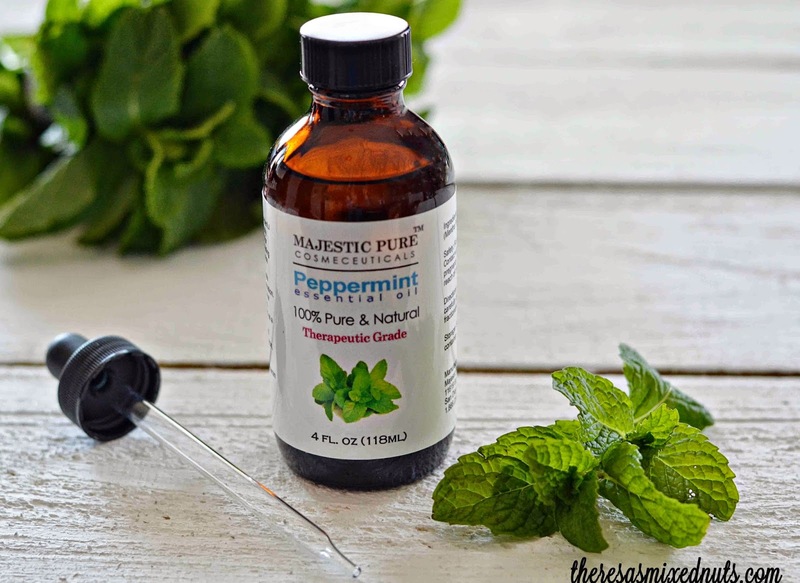 One of my favorite Peppermint Essential Oils is from Majestic Pure Cosmeceuticals. Majestic Pure offers premium quality peppermint essential oil that is 100% pure and natural. It is non-toxic, has no additives, no fillers, is unfiltered and undiluted. It is suitable for vegans and vegetarians. I like that is comes in a large, tinted glass bottle that comes with a dropper for easy access. I have seen other peppermint essential oils running for twice as much as what you get from Majestic Pure. You get a generously sized 4 ounce bottle on Amazon for $14.50! Peppermint Oil is intense and more concentrated than other oils, so it may be necessary for those with sensitive skin to dilute the oil with a carrier oil like jojoba or almond oil before use. My lips get super chapped in the winter and I love to make my own natural healing and cooling lip balm. This recipe leaves my lips soft and moisturized, and it tastes good too! In a small saucepan over low heat, warm oil, beeswax and honey until just melted. Remove from heat. Add in peppermint essential oil. Set pan in shallow ice-water bath. Using a whisk, rapidly stir for 30 to 60 seconds until the honey is incorporated and mixture starts to turn thick (like the consistency of frosting). Pour mixture into an airtight container. Seal closed. Let mixture sit for 2 hours before use. I love to use scrubs on my body, and adding essential oils is a great way to get some aromatherapy benefits too! My feet get really dry in the winter, but when I use this Peppermint Foot Scrub, it leaves them feeling soft and moisturized. Best of all, it feels so good on tired and swollen feet! Combine Epsom Salt and Olive Oil until just mixed. Add in peppermint oil. Stir to combine. If desired, add in a drop or two of food coloring. I used green to stick with the overall mint color theme, but it's totally up to you if you want to leave it natural color or select a prettier one. *To avoid getting water in the bottle, scoop out what you need before getting into the shower. Rub into damp feet until all salt is dissolved. Do you use essential oils? Which one do you use most often? This sounds great. I love peppermint anything. I use olive oil on my face. It's amazing. I've never tried it on my face. Just my body and hair. Do you rub it in and leave it on, or do you use it in a mild kind of face scrub, then wash off? I've cut most of the crap and still get them chapped. They are fine in the summer, but when dry winter air hits I need to have the balm close by at all times! I don't care if he is my husband. I am NOT scrubbing his feet. I think feet are just so gross! I need the lip balm. I have the same peppermint oil as you. I should use it for that. The foot scrub sounds amazing to! 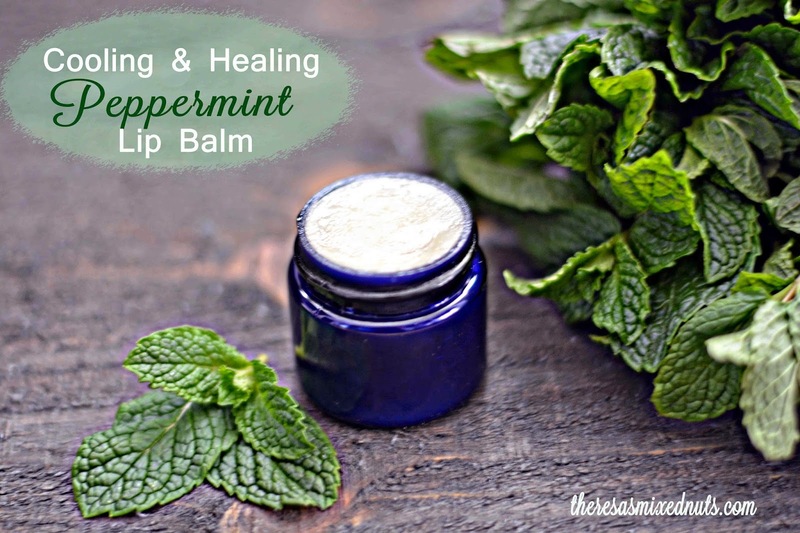 You should totally make the balm with your Majestic Pure Peppermint Oil Alissa! I think you would love it! They help me stay in my crafting mode when I don't have a lot of time to hassle with a big project. And they save $ too! I use peppermint oil when I have a cold. I also have some soap with peppermint in it. 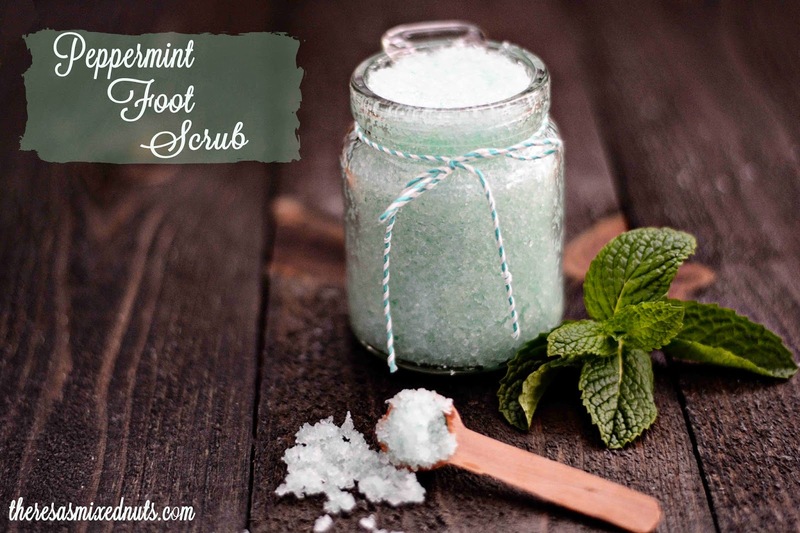 This looks really good, coincidentally, my daughter made me some peppermint foot scrub for Christmas, and I loved it! I have never used essential oils. This sounds awesome. I am fairly new with essential oils, I have not heard of this brand. Peppermint oil is so versatile and great for so many things! I love, love, love, peppermint oil and all the different ways you can use it. I use it for my stomach quite a bit. I never realized how many things peppermint oil could be used. I have a friend who is very into essential oils. I need to learn a little more about them and use them. Peppermint EO is one of my favorites. Thanks for the ideas to do with it! I love using peppermint oil. It and lavender are so great for headaches. I mix the two. Perfect migraine medicine for me. Peppermint oil sounds like some kind of liquid miracle! If I put a few drops on my car, will it make it run? I've always fancied trying to make my own beauty products, I love the sound of using peppermint in them especially for a fruit scrub! LOVE peppermint. Homemade lip balms are definitely the best! My only problem with these types of peppermint products is that I want to eat them up. I am picturing how warm and tingly this peppermint foot scrub would feel on my feet. I need me some! I have winter feet the kind that are drying up and looking they they been hiding for months that's because I live in Michigan and my feet haven't seen very much light besides slipping in and out of showers and in and out of socks. Peppermint is great for feet and makes them feel so soft I often forget to take care of my feet with the extra oils and such. That sounds amazing and I bet they all smell awesome as well. What a fun and relaxing way to pamper yourself. Peppermint can do wonders! I like this idea for a DIY foot scrub! My feet need some love! I'll have to try these products. They sound so good and also delicious! I use essential oils all the time. I've been using Meleluca (tea tree) for years. I think my most used is a tie between peppermint and lemon. I love lemongrass as a perk-me-up.. it's my fave essential oil to use :) You're really amazing to make your own lip balm and scrub~! I love oils! I have some of their lemon. I use lavender on a daily bases with my youngest. it helps her sleep. I love these ideas! I would especially love some of that foot scrub, it looks wonderful and so easy to make too! I've been wanting to make some for a year now, but hadn't. Until this weekend. It's so good! I did a lemon flavor. This sounds like it would work on so many levels, can't wait to try it out. I've long been a believer in being my own best health care advocate. Love that you can make it so easily! Sounds amazing! The wonders of oils and all that you can do - it's amazing! Essential oils are great. I want to make the lip balm. Thanks. I love peppermint oil! I usually have extra at home because it smells so goood...I haven't tried making foot scrub though, because I haven't stocked epsom salt. Looks like a great idea to have some .. I need to try this! I keep hearing about essential oils and all their benefits! I love the idea of all natural! I just pinned another DIY peppermint lip scrub from my friend. She used coconut oil and sugar, but I also have olive oil so will give this a try. I am trying to find good recipes for more natural products and I will definitely be trying this! I really want to try this - my feet are so dry from the winter. Where do you get the peppermint oil and the beeswax? You can get the peppermint oil from Amazon or any health food store. The beeswax I got from MIchael's Craft Store. A 2 pound brick was $19 but they let you use a coupon. They normally offer 40% off coupons in their weekly flyer and online, but sometime you can find a 50%, and that's what I used. This is fantastic! I'm obsessed with peppermint essential oil. It helps me during migraines and when I'm not feeling well. Love your recipe and it makes for a really great and thoughtful gift too.